Sundays are the best day to spend time alone with our husband by going out and do something together. Trips to bookstores, friends’ humble home (who also unfailingly reminds us of Allah Ta’ala in everything that they do) and sometimes just quenching our thirst at the nearest lassi or juice joint- which has always been the highlight of our day, Masha’Allah. My husband loves buying me books and I love reading them in return, regardless of what he bought me. All of the books he ever bought are on Deen and unfailingly it has always opened up my perspectives, as a guide sent by Allah (in a form of books) whenever I asked of Him. Alhamdulillah. Whenever we go to these bookstores, usually I’ll wait in the car as the bookstores are usually filled with ‘maulanas’. 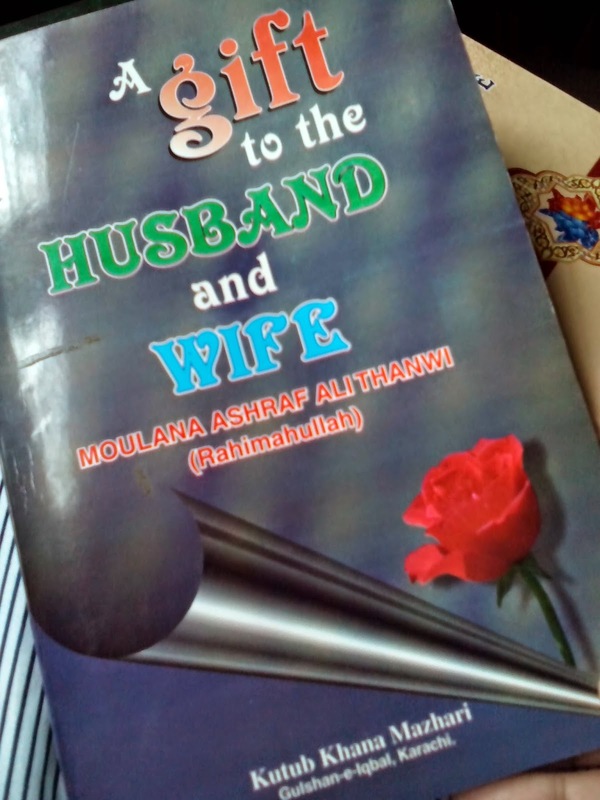 He bought me another 3 books (may Allah reward my husband with khair) and one of it simply titled, “A Gift to the Husband and Wife” by Maulana Ashraf Ali Thanwi. 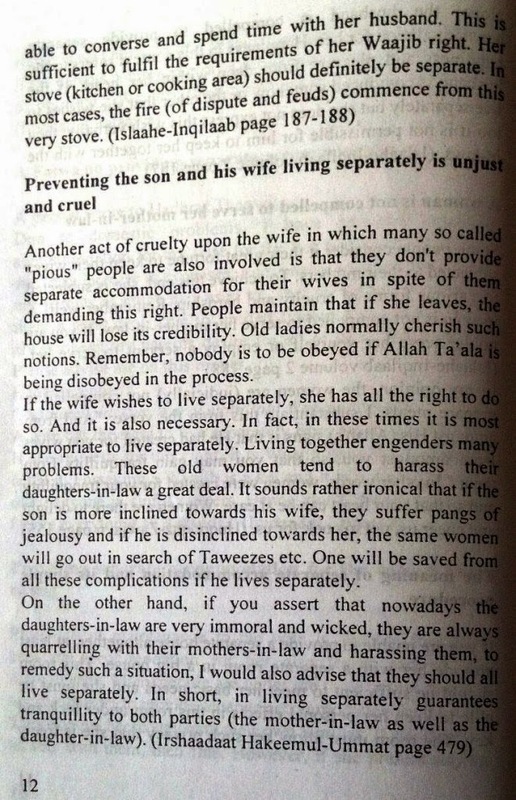 This is the translated version from its original Urdu book and hence, the language is to be excused a little (remember Yoda? ), but, we shall never disregard the content. 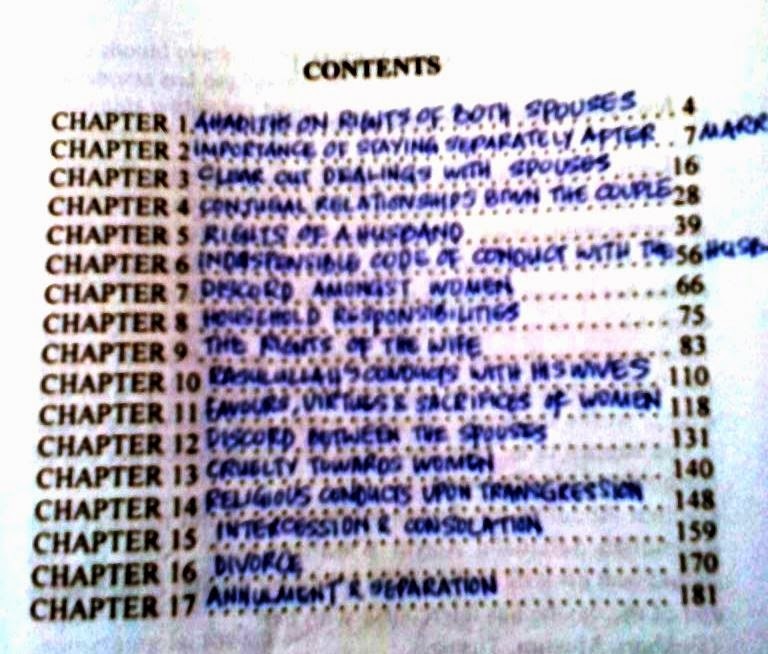 I took the liberty to write down the title for each chapter as it was not readily available (also for better future references). 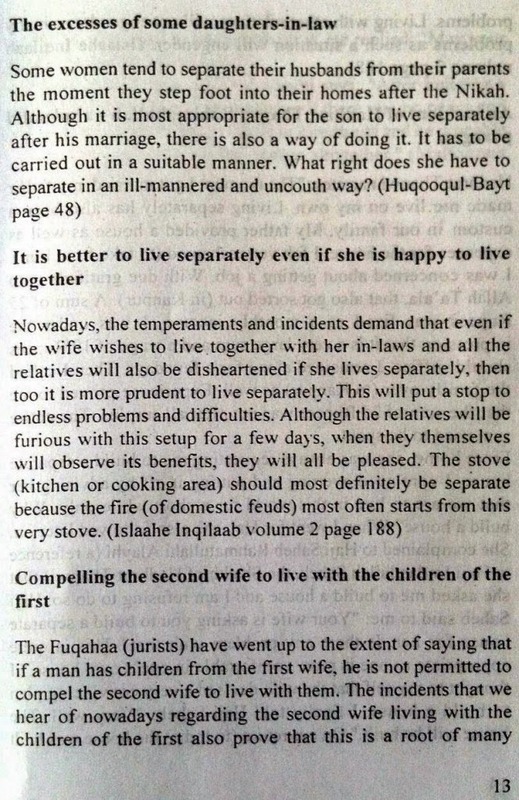 The first chapter was a brief 2-page recollection of hadiths on the rights of both, husband and wife, and the second chapter reads, "The Importance of Staying Separately After Marriage". I'd say, this is interesting enough to read the rest of the 8-pages of this chapter. Its very informative and leads to the fact that Islam is just to its believers, in any situation and predicament. 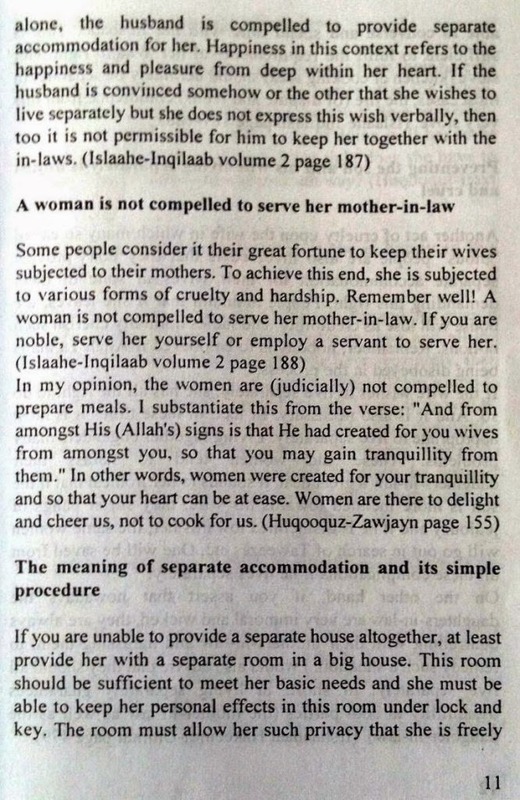 Islam will not be 'the way of life' if its not guiding us towards achieving 'sukun', Insha'Allah. 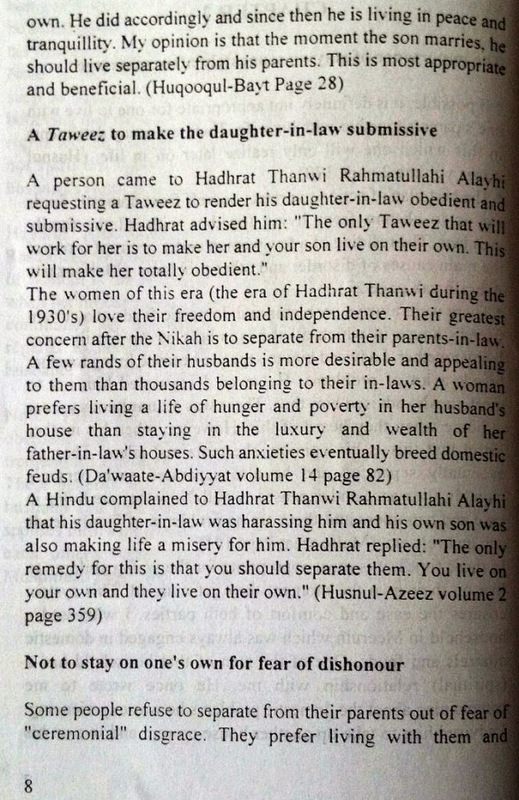 Hadhrat Thanwi narrates: "The moment I got married, my father made me live on my own. Living separately has also been a custom in our family. 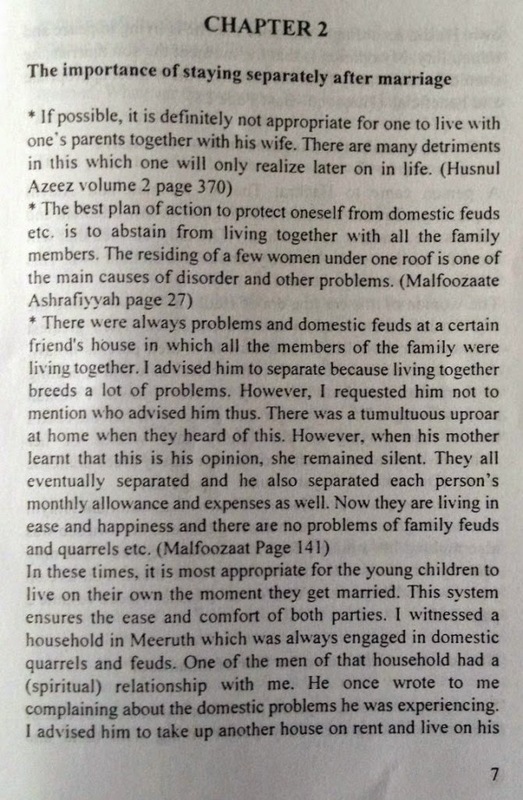 My father provided a house as well as expenses for the house. I felt very ashamed (to take from him). I was concerned about getting a job. With due gratitude unto Allah Ta'ala, that also got sorted out (in Kanpur). A sum of 25rupees was fixed as a monthly income. I was under the impression that it is a very large sum and a wage of 10rupees should suffice. I remained alone for a few days. Then I called the family over (to Kanpur) as well. Experience proved to me that the sum of 25rupees was not after all surplus. The entire sum used to be spent. From home, she was always requesting me to build a separate house. I continued averting and putting it off by advising her that we are to live in this world for a short while only. Why build a house? When I went for Hajj, she also followed later on. 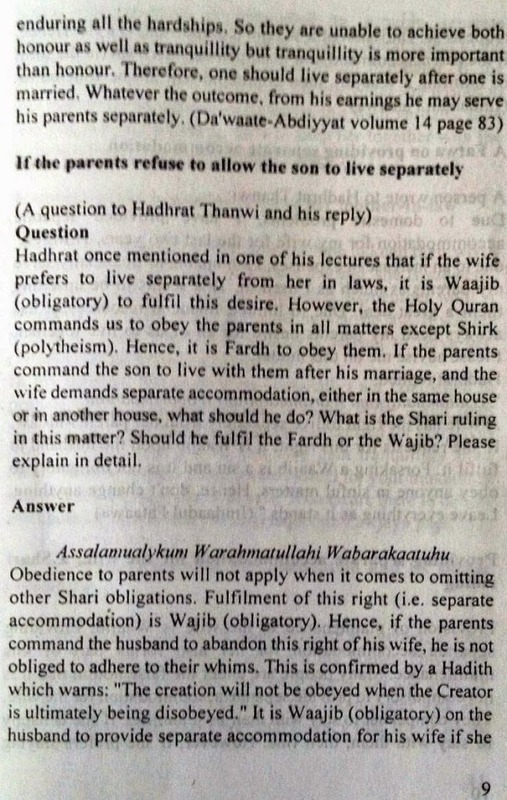 She complained to Haji Saheb Rahmatullahi alaihi (a reference to Haji Imdaadullah Saheb, the Shaikh of Hadhrat Thanwi) that she asked me to build a house and I am refusing to do so. Haji Saheb said to me, " Your wife is asking you to build a separate house for her. Is there any problem with that? This is quite appropriate as one is more comfortable in one's own house." I thought to myself that the wife devised a very convincing plan to build a house. I finally told Haji Saheb: " Very well. The house will be built." 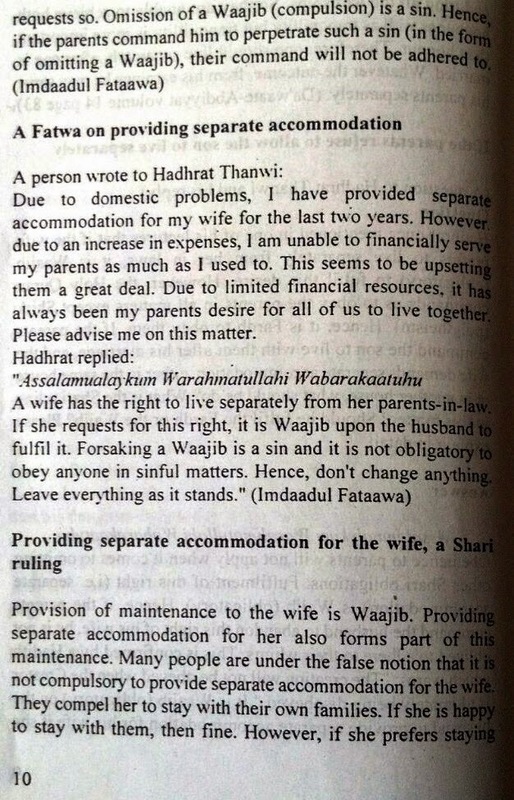 On our return (to India), the house was built and I also wrote to Haji Saheb about it. He replied, "May your house be Mubarak (blessed)." A Gift to the Husband and Wife, Maulana Ashraf Ali Thanwi, Kutub Khana Mazhari, Gulshan-e-Iqbal, Karachi.